New Seafood Guidance for Pregnant Women and Children. WHAT? I thought that it’s good for me to eat fish. Generally speaking, eating fish is good for you. There are a lot of health benefits to eating a diet that contains fish. The protein and oils from safe fish are really great for brain and eye development of babies and children. 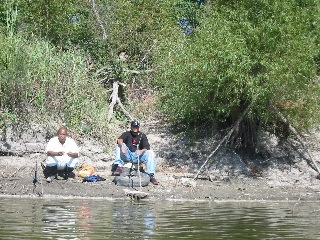 But when you go fishing on the Kansas River there are some things you should be careful about. Download brochure from attachment section at the bottom of this page. In January 2018 the Kansas Department of Health and Environment (KDHE) and the Kansas Department of Wildlife and Parks (KDWP) issued a new fish consumption advisory for the Kansas River. 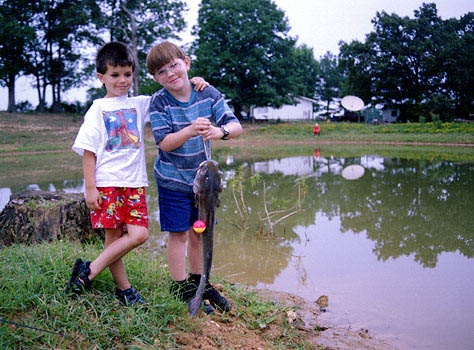 Bottom-feeding fish include carp, blue catfish, channel catfish, flathead catfish, freshwater drum, bullheads, sturgeons, buffalos, carpsuckers and other sucker species and have been found to have high PCB levels. Bottom feeding fish, like catfish, buffalo, carp, drum and sturgeon are more likely to have high levels of harmful chemicals like PCBs. These harmful chemicals are concentrated in the mud. Bottom feeding fish tend to collect more of these contaminants because they live on the bottom and they swallow a lot of mud with their food. Fatty or oily fish will tend to collect more contaminants like PCBs, Chlordane, pesticides and dioxin that are stored in fat. (EPA) that recommends consuming no more than one 8-ounce meal per week of locally caught fish. Mercury comes from a number of sources, including coal burning power plants, and is deposited on the waters surface where it is taken up by small plants and animals living in the water. Mercury becomes more concentrated as you go up the food chain, so the levels are highest in predatory fish like largemouth bass, and is highest in larger fish since they are older and have had more time to accumulate mercury. Check out Mercury Rising: Enjoy Fish Without the Risk for information on what fish have the lowest mercury levels and are safe to eat. Mercury is more of a problem in sight feeding fish than in bottom-feeding fish, and it is more of a problem in lakes than in rivers. 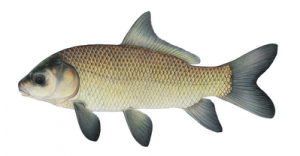 So while PCBs and Chlordane have triggered advisories for eating catfish and other bottom feeders in the Kansas River, mercury has triggered advisories for eating largemouth bass and other sight-feeders caught in lakes. Should pregnant women and children stop eating all fish? No. The protein and oils from safe fish are really great for brain and eye development of babies and children. Which fish are safe for them to eat? 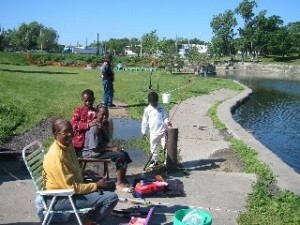 Pregnant women and children can eat fish caught where there are no fishing advisories. It’s still a good idea for them to avoid eating the most dangerous fish. Which fish should we avoid? Really large fish tend to be more dangerous to eat because they are older. An old fish has had more time to collect more harmful chemicals. It’s better to eat younger, smaller fish. Women who are pregnant or breastfeeding, children under six years old, teenage girls and women who could become pregnant should avoid eating fish caught in areas with fish consumption advisories. Why are pregnant women and children more sensitive to contaminants in fish? Chemicals like PCBs and Chlordane are stored in your body for years. When a woman gets pregnant, the harmful chemicals stored in her body get passed on to her baby. Even when the chemical levels are too low to hurt the mother, her baby can be harmed. Babies grow very fast. These chemicals can be harmful to them either because they effect their developing brains or because they harm their immune systems. If you are pregnant or nursing, please consult your pediatrician if you are worried about the effects on your baby of eating contaminated fish. Children under six years old should not eat fish caught in areas with health advisories because their kidneys and livers are not as efficient as an adult’s. Since they aren’t as good at getting rid of the contaminants they eat, harmful chemicals get more concentrated in a small child’s body than they do in an adult. Their brains and bodies still have a lot of growing to do. So much is built upon this early growth that early damage can have lifelong effects on their health and abilities. How can you safely prepare fish? You can find a picture of how to properly trim a catfish in our brochure in the attachment section of the bottom of this page. Unfortunately you can’t reduce the amount of mercury in the fish you cook like you can PCBs and Chlordane. This is because mercury isn’t concentrated in fat. Mercury is spread throughout the fish and can’t be trimmed away. Mercury is a problem nationwide. You can use the Sustainable Seafood Guide for the Central US (it includes freshwater fishes) when you go to the grocery store or a restaurant. Urge others to avoid fish and shellfish that are not sustainably harvested or that have dangerous levels of contaminants. We must always remember that what we pour down the tap, dump in stormdrains, or spill on the ground can make its way into the river. Please do your part to reduce pollution and stormwater runoff. 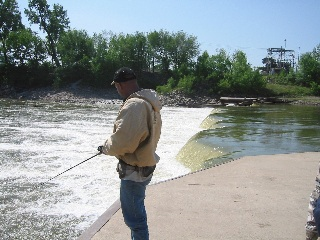 This brochure was published by the Friends of the Kaw with funding from Environmental Protection Agency(EPA) Region 7. Fish illustrations by Joe Tomelleri. Video by Mike Cuenca and Rich Ambler and assisted by Laura Calwell . Photograph by Mike Cuenca.